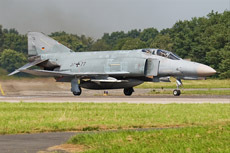 After I’ve heard many stories about the excellent photography opportunities on the North-German air base Wittmundhafen, I decided to go there without the knowledge of what was going to happen on Tuesday, July 29, 2008. 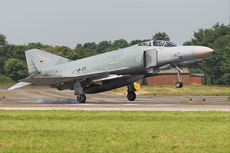 This base is the only place in Western Europe where the F-4 Phantom II is still operational. 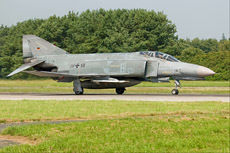 One of the four traditional air defensive units of the German Luftwaffe is based at Wittmundhafen. 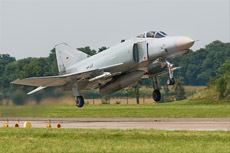 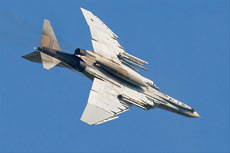 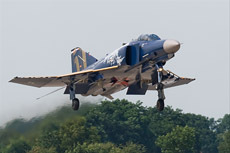 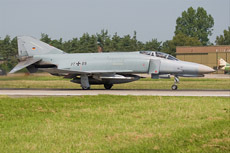 The unit called Jagdgeschwader 71 (JG-71) is the only one out of four units which is still operational with the F-4F Phantom II. 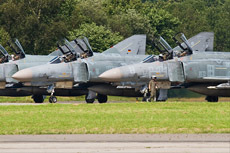 JG-72 at Hopsten has been disbanded a few years ago and that base is nowadays closed. 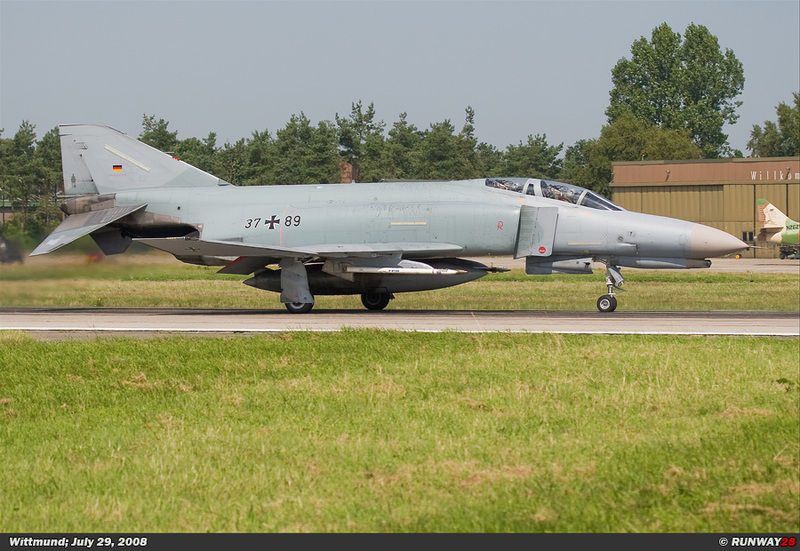 JG-73 based at Laage and JG-74 based at Neuburg are nowadays already converted to the EF-2000 Eurofighter. 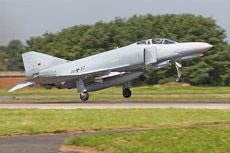 Wittmundhafen is because of that the only base in Western Europe where the F-4 Phantom still has an operational function. 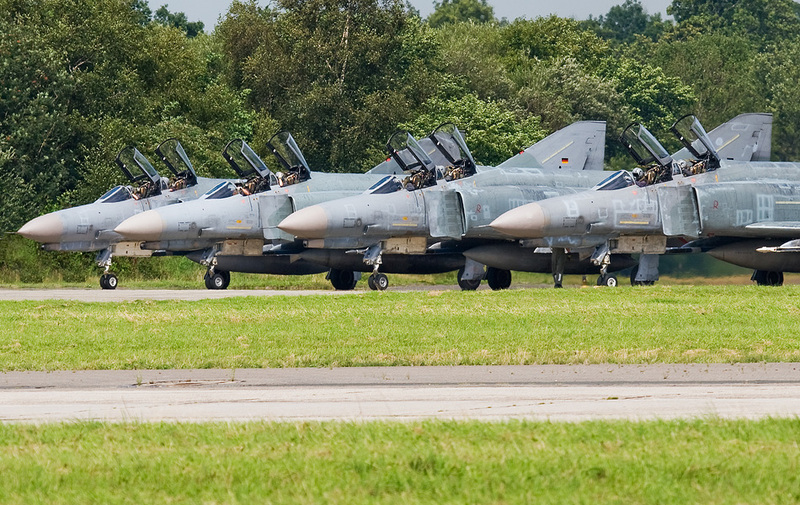 The main task of this base is to defend the Northern German airspace and guard it against unwanted intruders or unidentified objects. 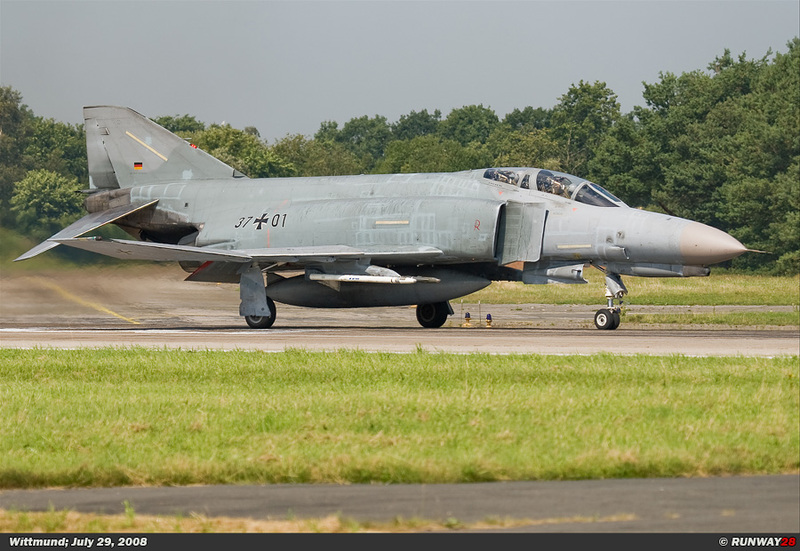 JG-71 was founded on June 6, 1959 at Ahlhorn, Germany. 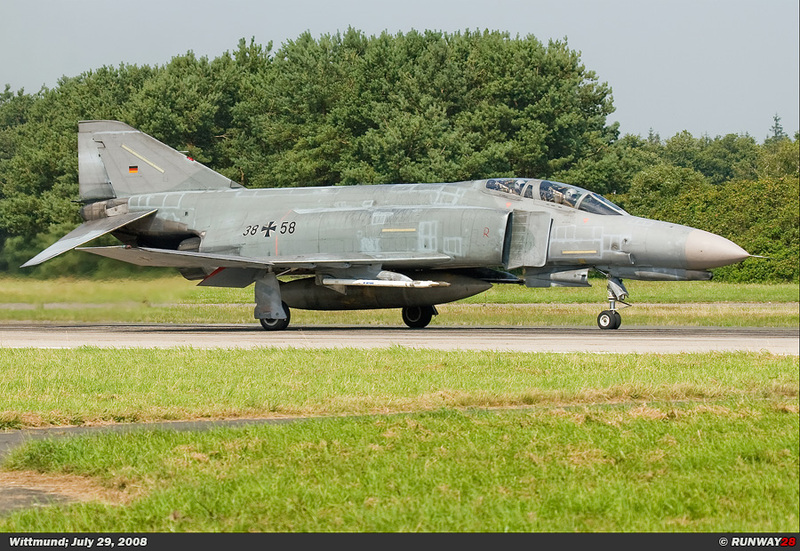 In 1960 it received the mission from the NATO to defend German airspace during the Cold War. 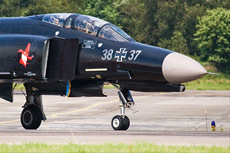 The unit received the traditional name Richthofen exactly 43 years after the death of the Red Baron Manfred von Richthofen. 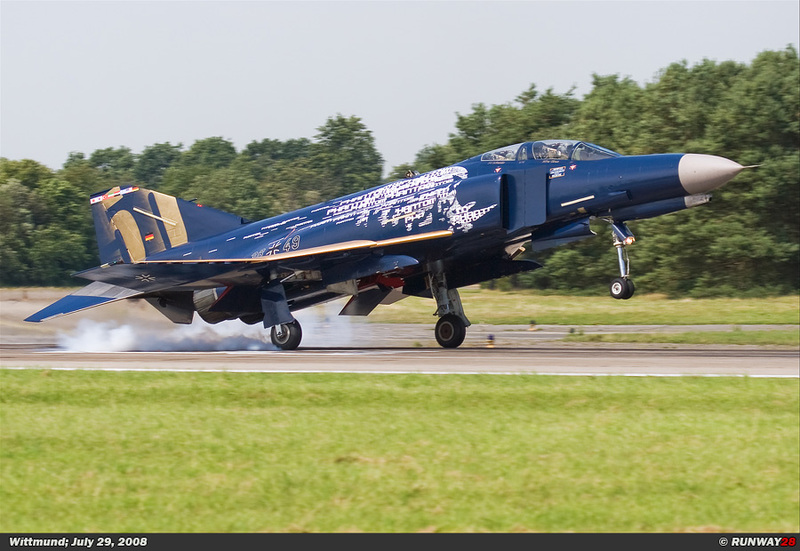 The great name of Von Richthofen was in this way honored with the approval of the Federal Chancellor Heinrich Lübke. 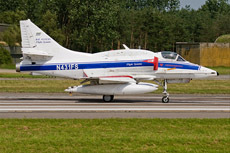 In 1963, the unit moved to its current location Wittmundhafen and it was also converted from the F-86 Sabre to the F-104 Starfighter. 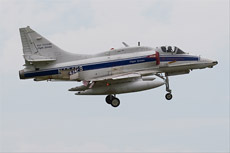 It was the first unit in Western Germany which was equipped with the Starfighter. 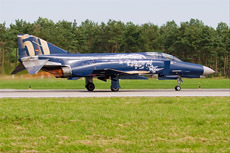 In 1974, the Starfighter was retired from its duty at this unit and replaced with the F-4F Phantom II. 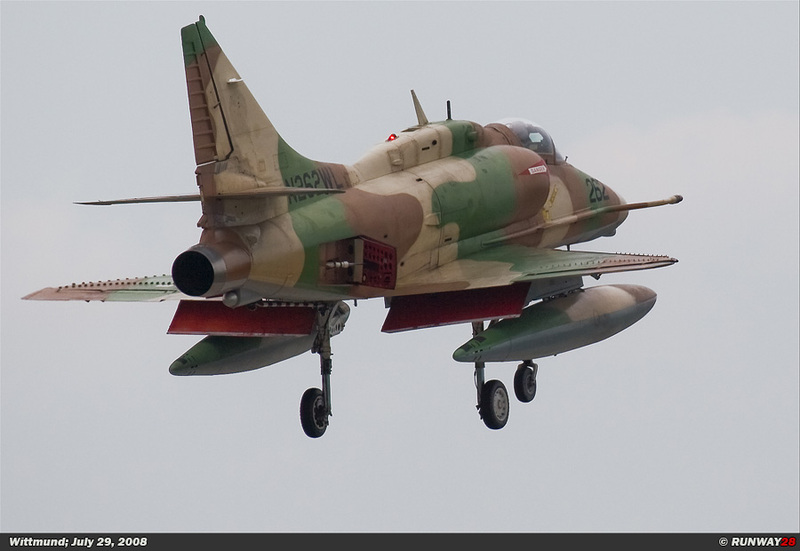 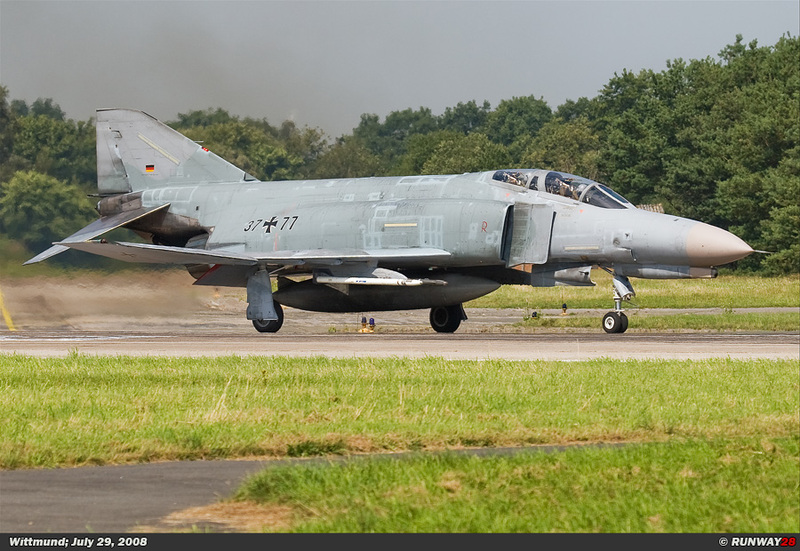 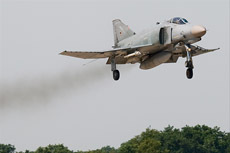 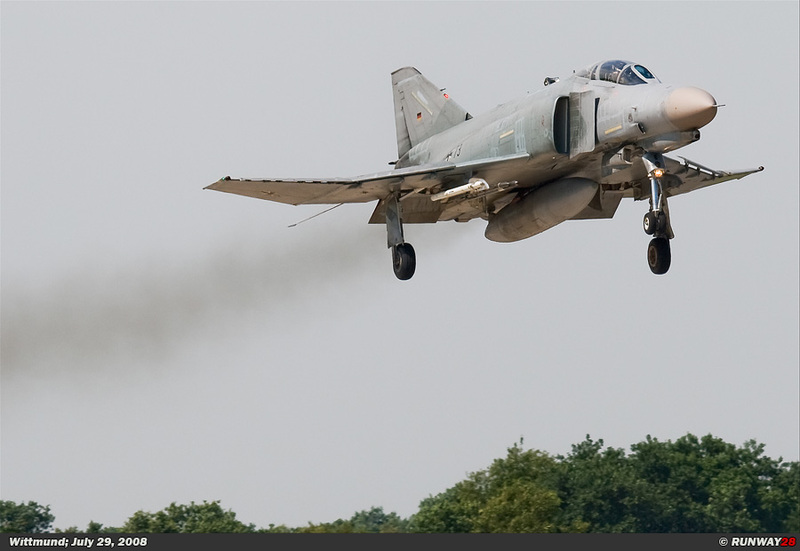 JG-71 is nowadays still operational with the Phantom. 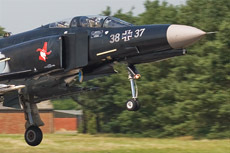 The Richthofen Phantoms are easy to identify by the red letter R on their air intake. 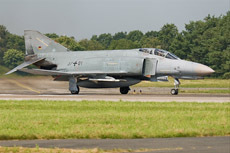 After a ride of 4 hours by car I finally arrived in the far northern part of Germany at about 8 am. I was glad that I had left home early, because when I arrived the first Phantoms were already waiting at the holding point at the beginning of the runway. 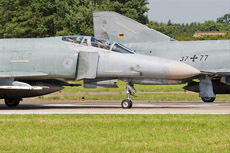 I found out the story that the Germans started to fly early each morning at this base was completely true. 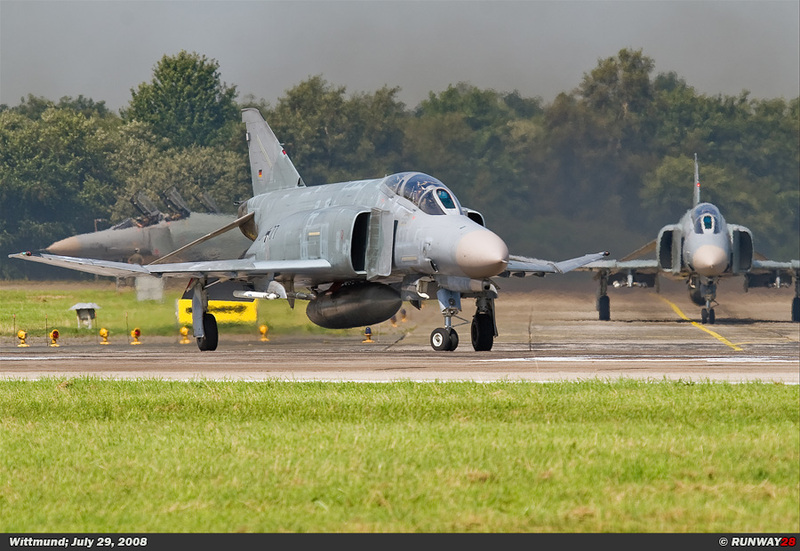 After I found a suitable spot along the fence, the first six Phantoms were already taking off. 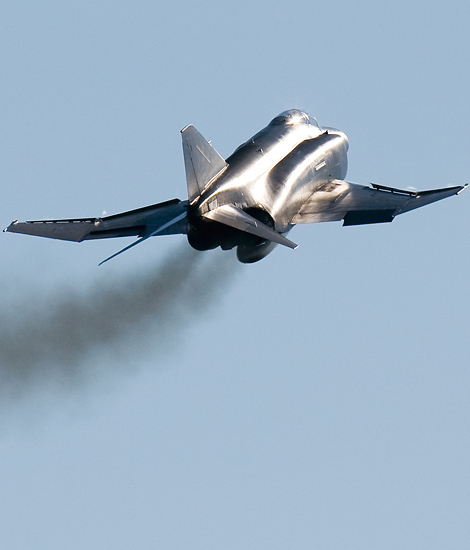 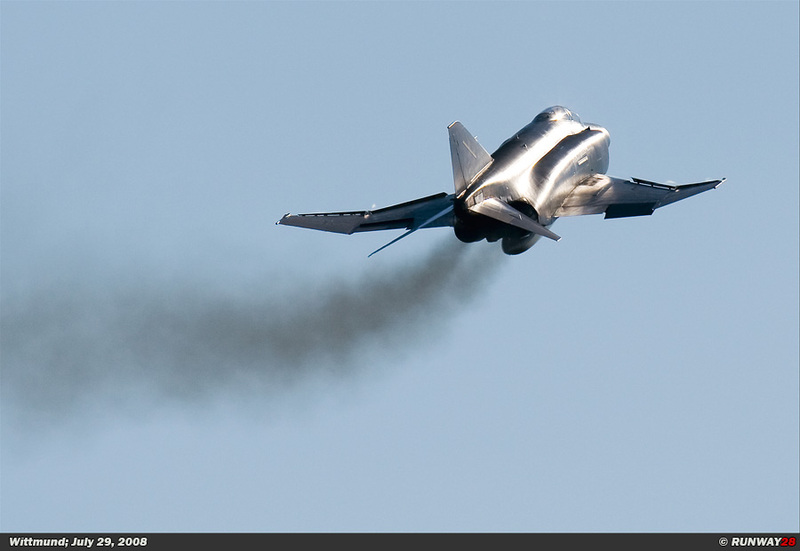 They made lots of noise with their afterburners and exhausted significant smoke plumes behind them. 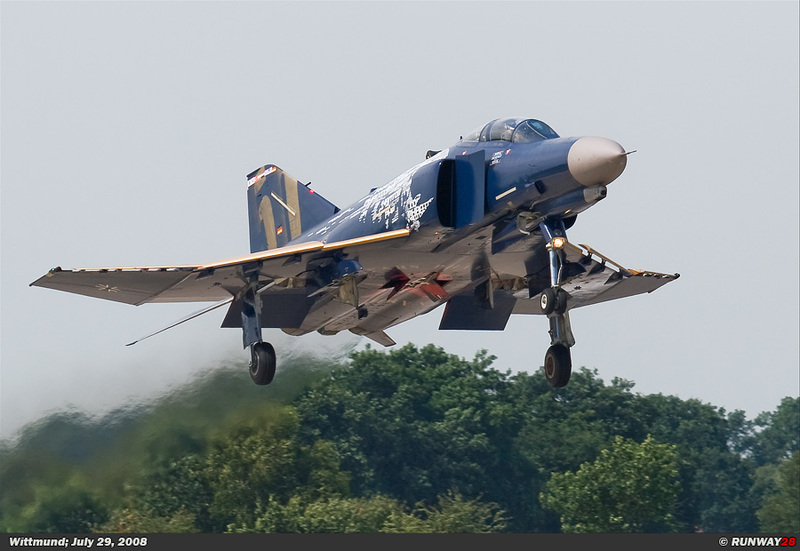 The weather conditions were perfect during this day with a nice blue sky and a nice warm sun; this gave me a nice effect on the Phantoms which departed with full afterburner at a distance of about 75 to 100 meters in front of me. 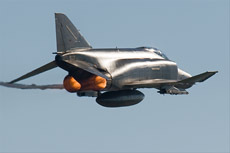 I decided to stay at this spot until the Phantoms had returned. 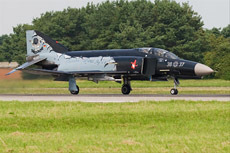 The spot where I was, was located halfway the main runway where normally the aircraft came loose from the ground. 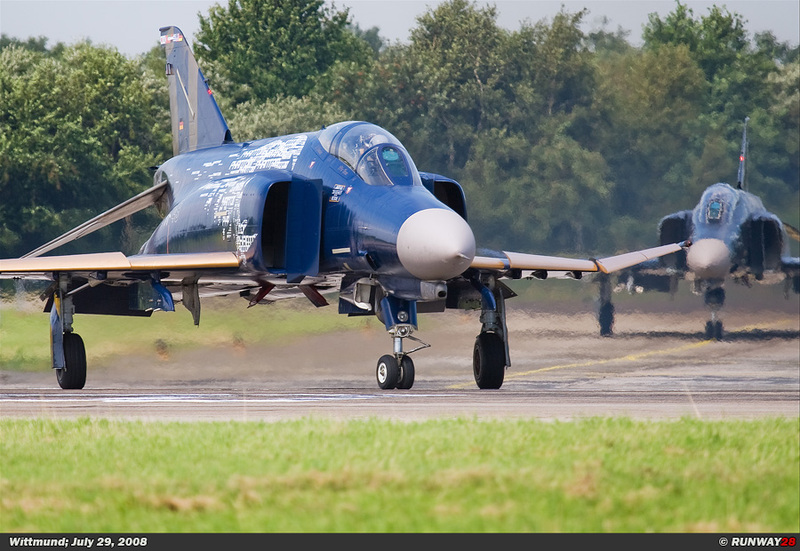 After less than an hour the first Phantoms were already inbound for landing. 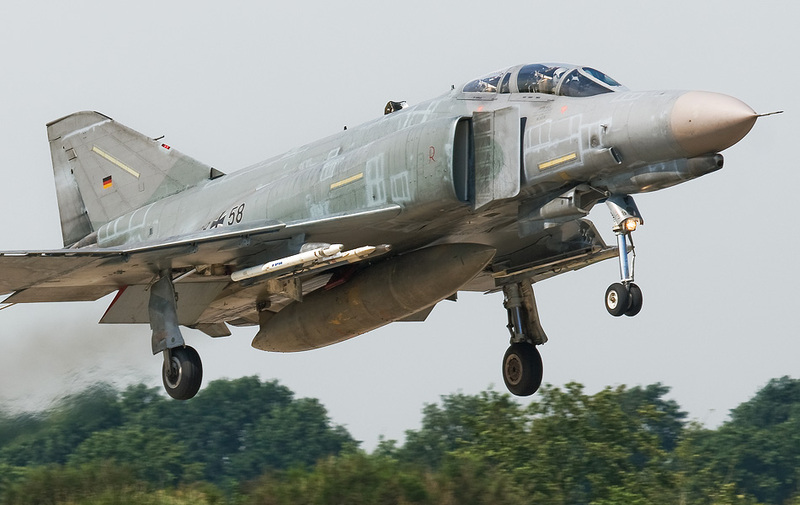 And the goal I had in mind was luckily achieved when the incoming Phantoms were rolling over the runway with their brake chutes behind them. This provided beautiful photos for this moment. 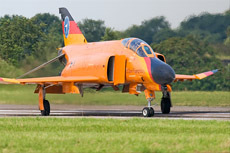 The Phantoms taxied all the way back to the far end of the runway to drop their chute over there. After the arrival of the first flight of the Phantoms, I decided to move to another location. 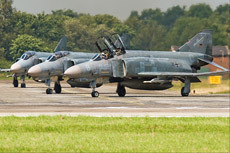 The holding platform is located almost at the beginning of the runway. 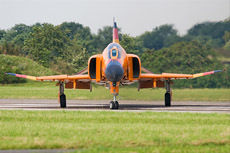 Normally the Phantoms will line up here and will be checked before entering the runway for take-off. 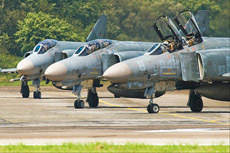 It was a wild ride by car to reach this place because of the bumpy roads around the field. 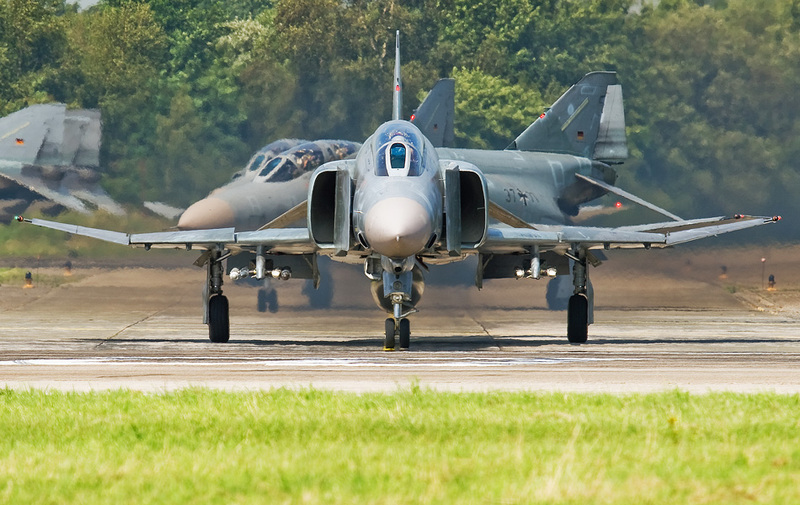 Sometimes the holes in the road were so deep that you really had to drive very slowly. 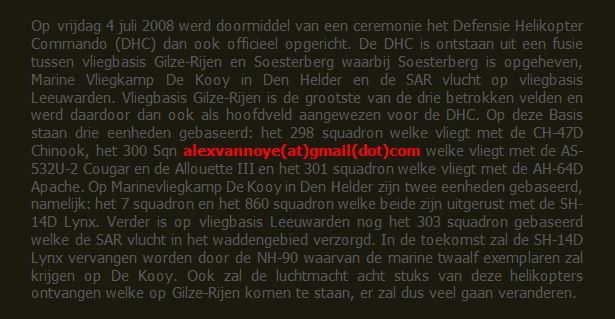 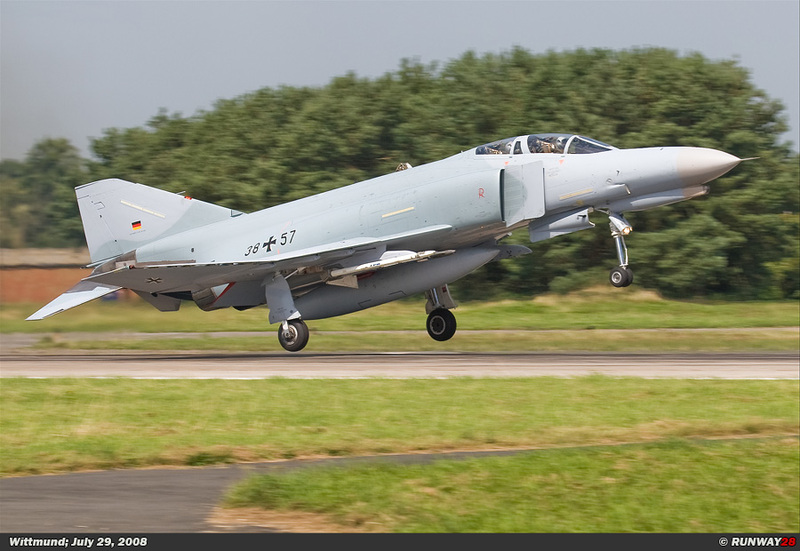 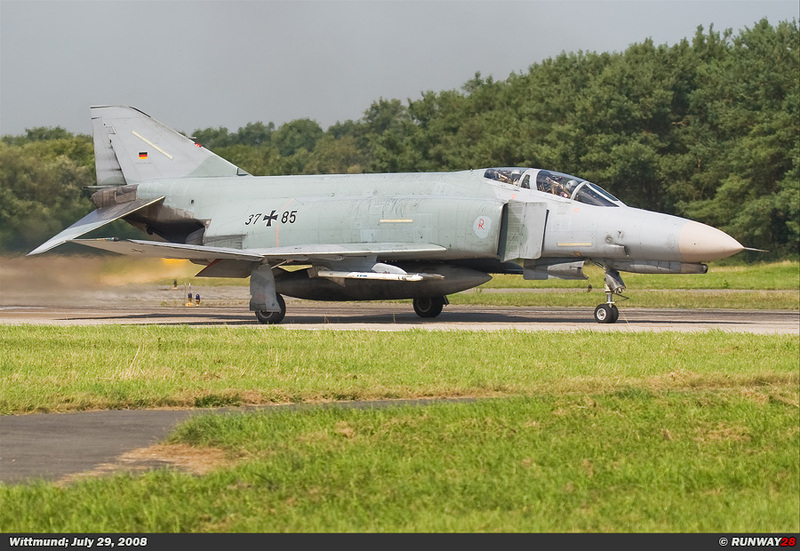 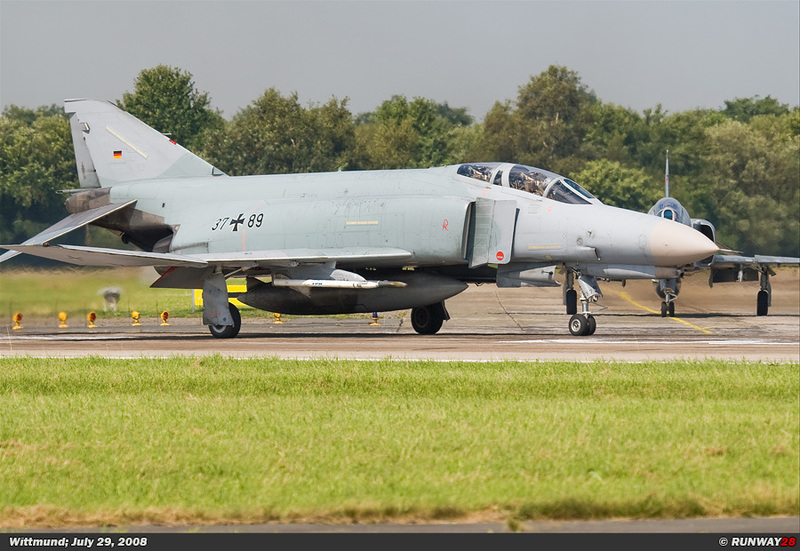 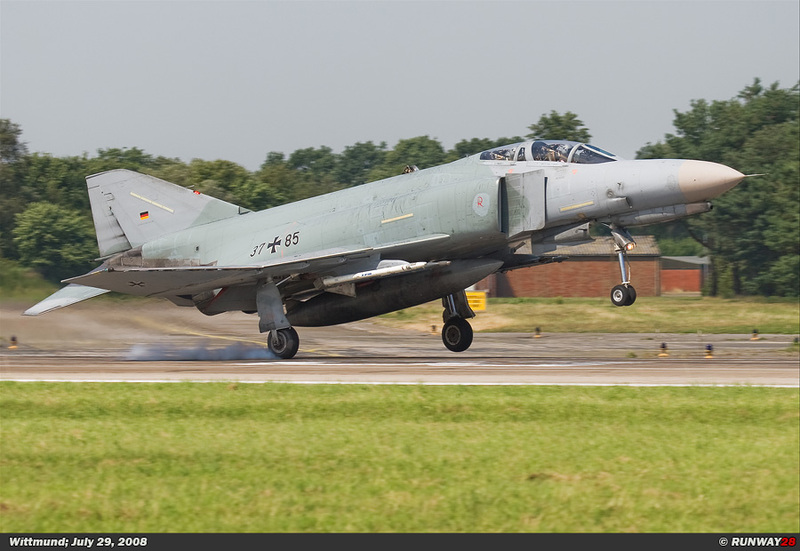 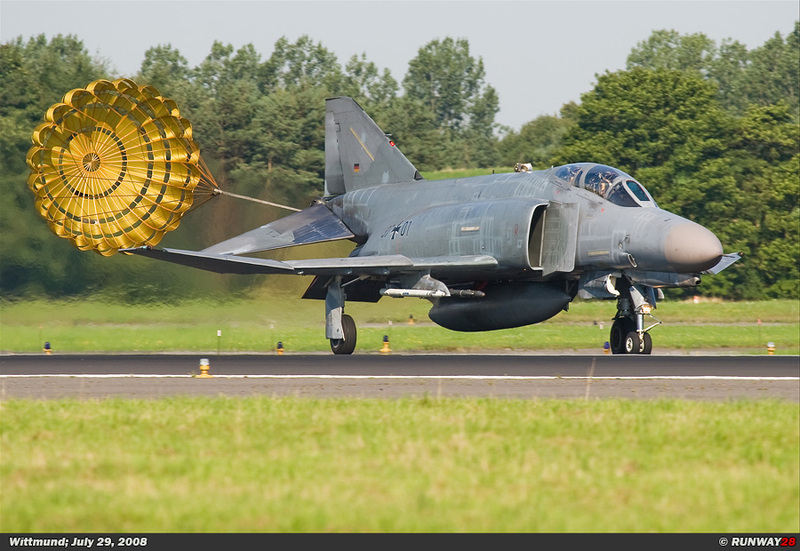 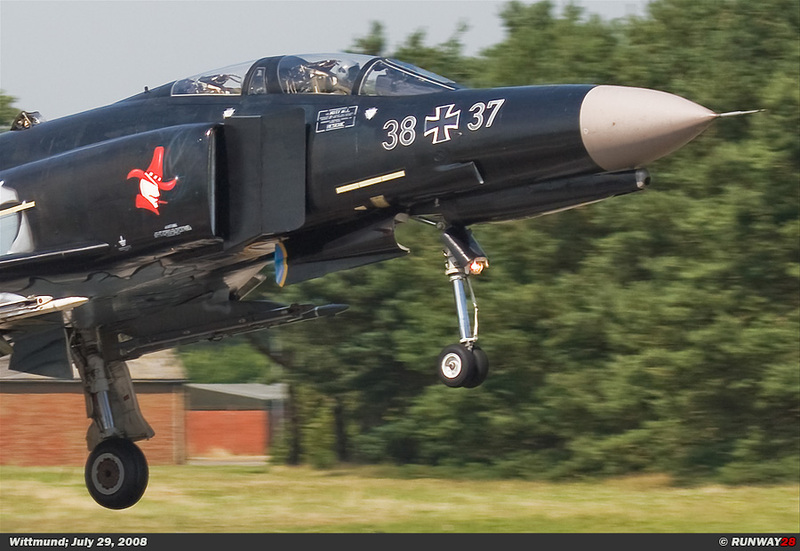 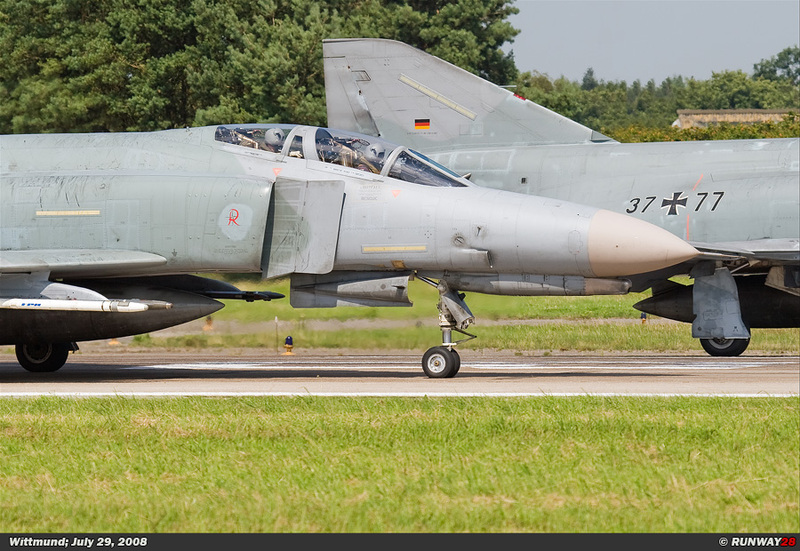 What I didn’t know was that the Germans would held a spotters day tomorrow at Wittmund to honour the 50th anniversary of the F-4 Phantom. 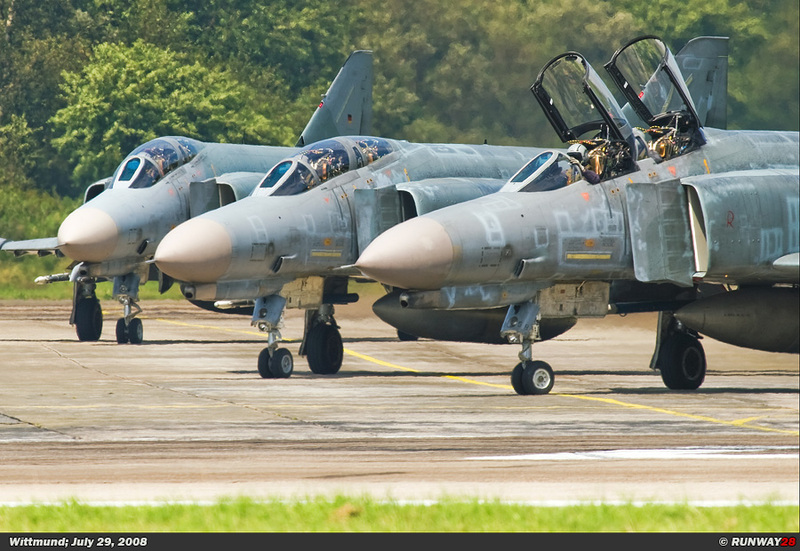 They arranged a few colored Phantoms for this spotters day. 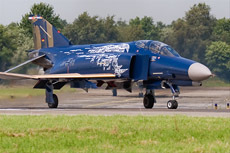 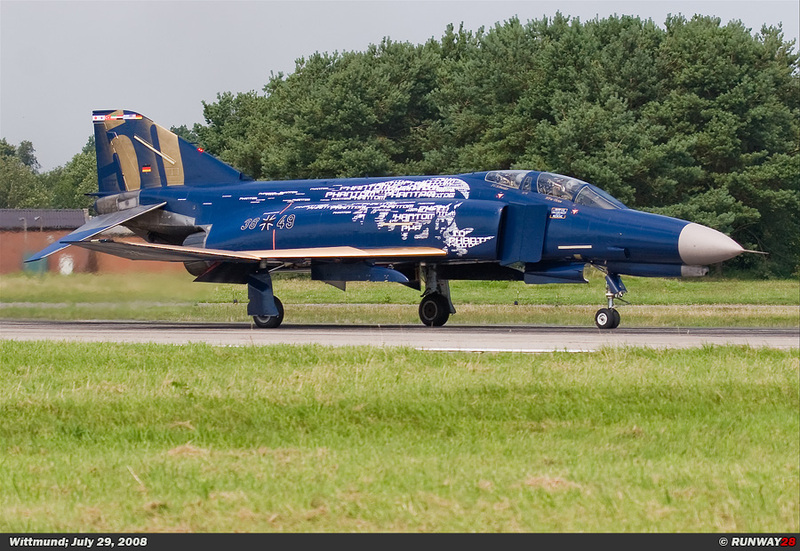 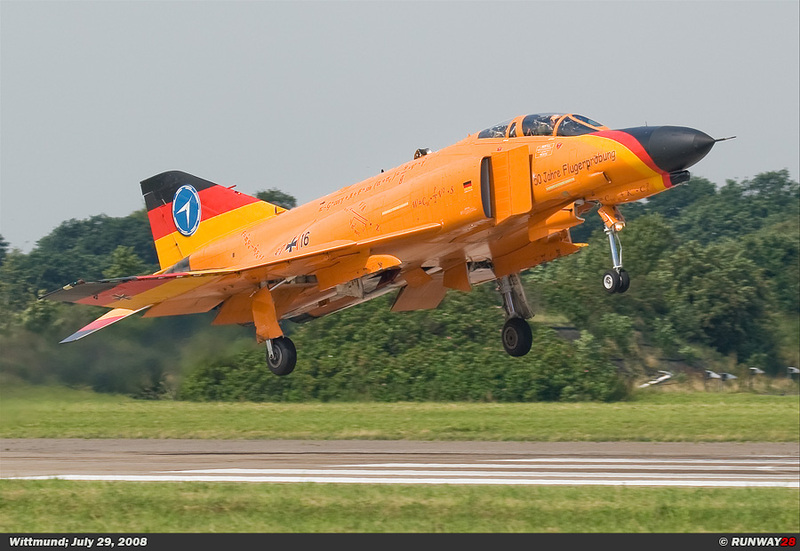 Normally not all these coloured Phantoms are based at Wittmund. Today the three colored Phantoms would fly out for an air to air photo shoot somewhere above Germany. 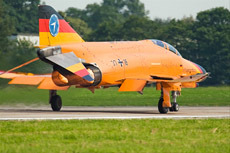 painted orange, which is the unit color of WTD-61 from Manching-Ingolstadt in Southern Germany. 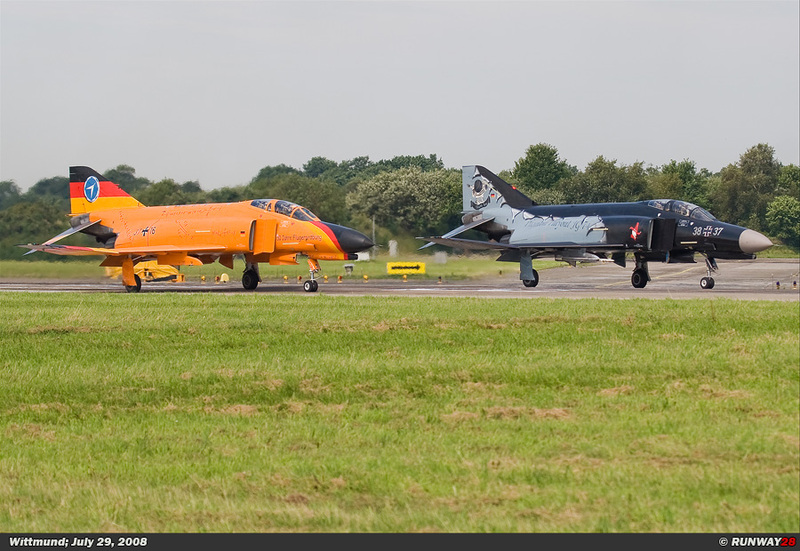 This test unit had its 50th anniversary; to celebrate this a Phantom and a Tornado were painted orange. 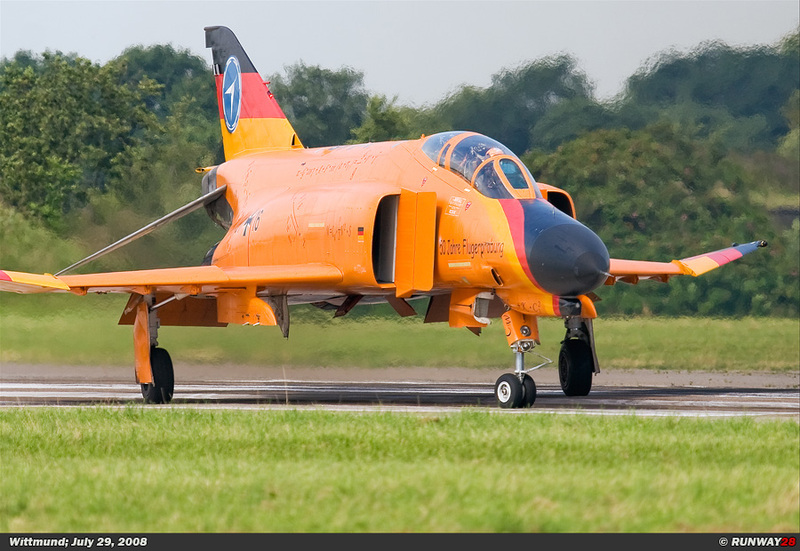 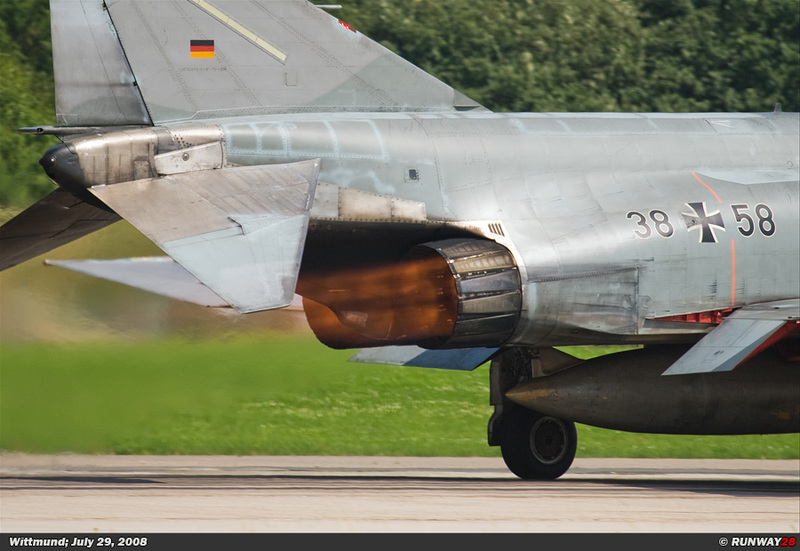 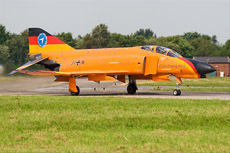 At Wittmund only the orange Phantom was present; they left the orange Tornado home. The third coloured Phantom was a remaining part of Neuburg which is already converted to the Euro Fighter. 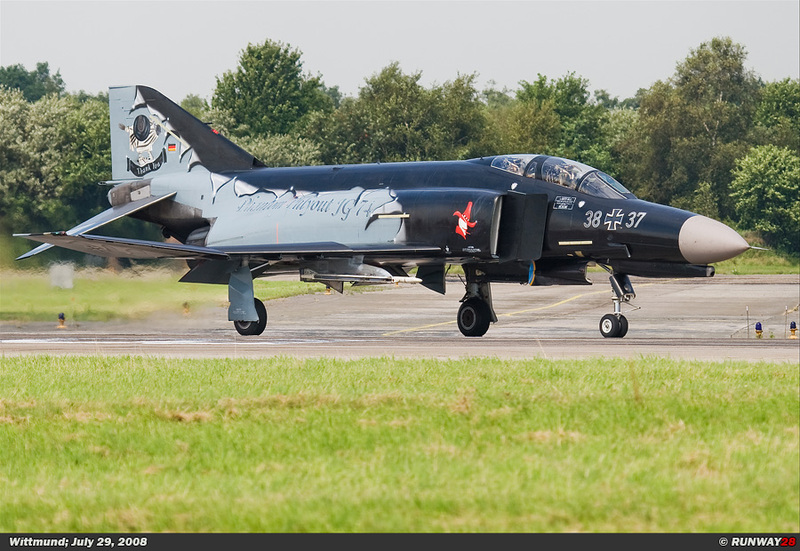 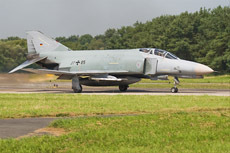 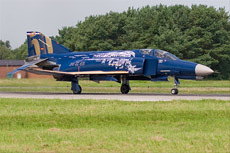 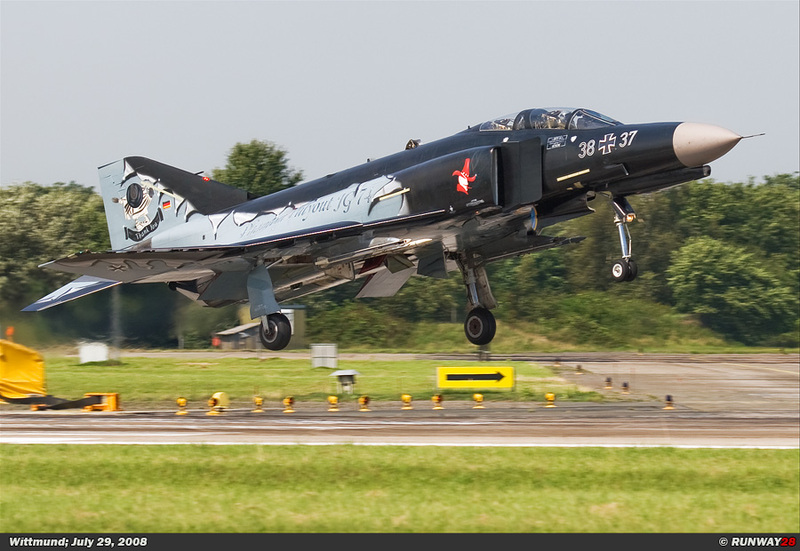 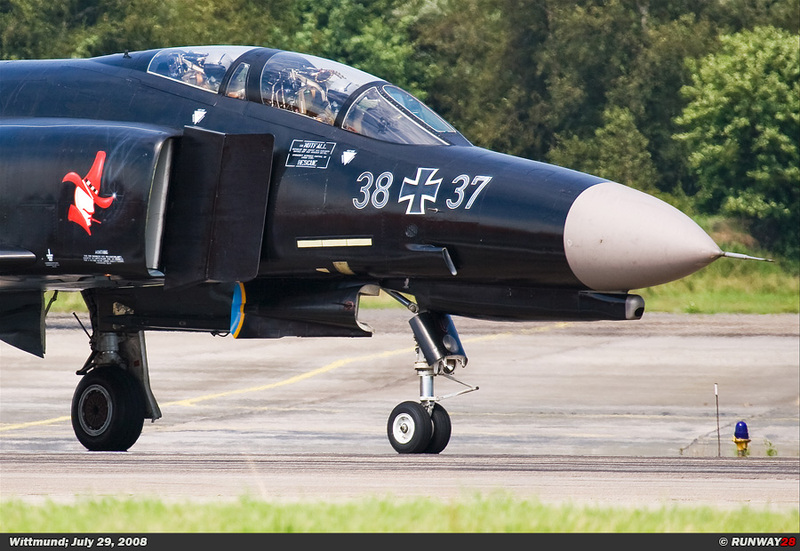 This Phantom was sprayed into a black and grey color scheme which symbolized the departure of the Phantom at Neuburg in Southern Germany. 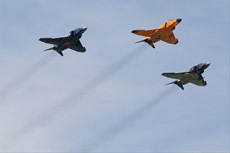 This moment was a unique moment; because this was the only time ever that all three coloured Phantoms flew together in one formation to celebrate the 50th anniversary of this aircraft type. 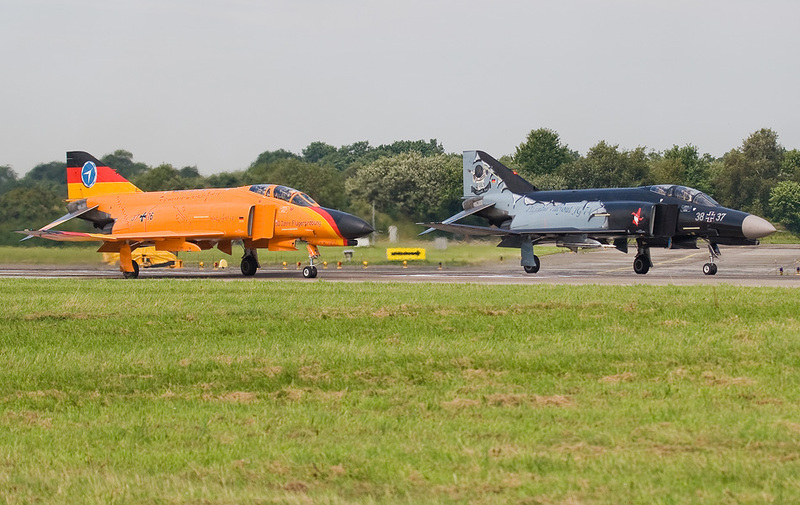 During the spotters day itself the coloured Phantoms were not flying, so the moment on which they flew together was quite unique. 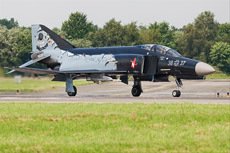 After the departure of the three coloured aircraft, the normal operational flights continued. 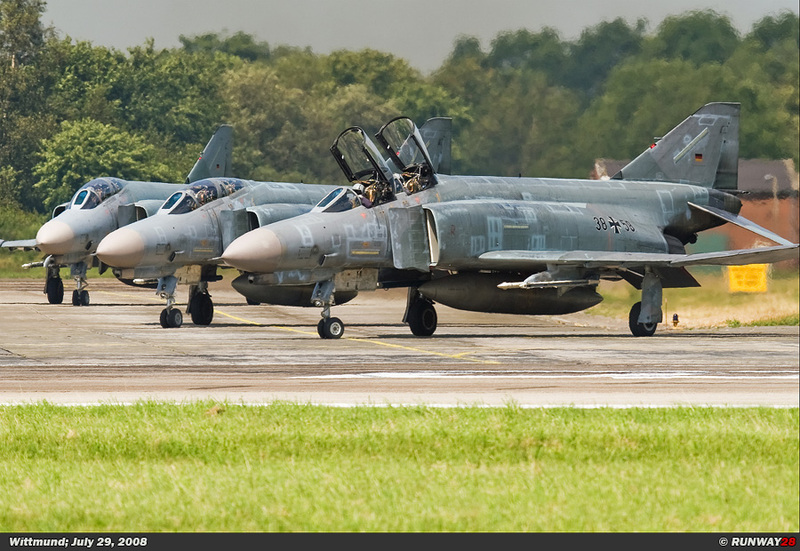 Soon many Phantoms were gathered at the holding point. 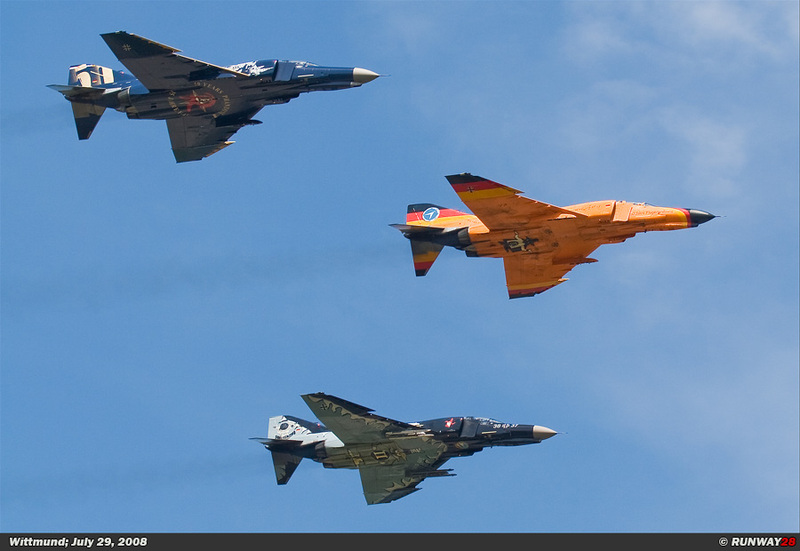 There were so many aircraft that not all of them could stand at this particular point. 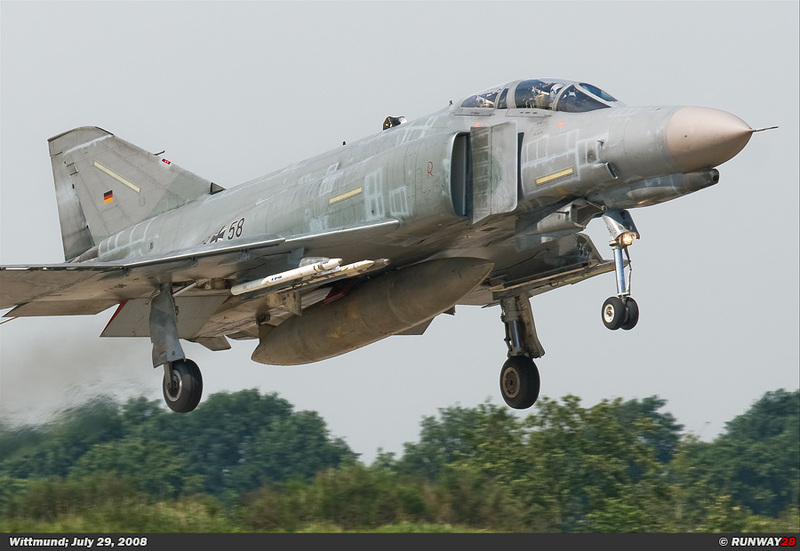 It surprised me that that there were so many Phantoms flying out in just one flight. 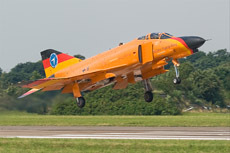 Finally 17 phantoms departed in one mass flight which is nowadays quite much. 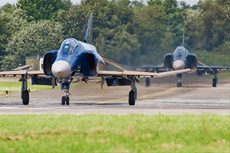 On the holding platform four Phantoms lined up nicely with their canopy’s open and the ground crew was very busy with checking these aircraft. 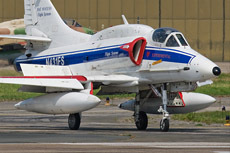 In the meanwhile a few aircraft came in which I apparently had missed in the early morning. 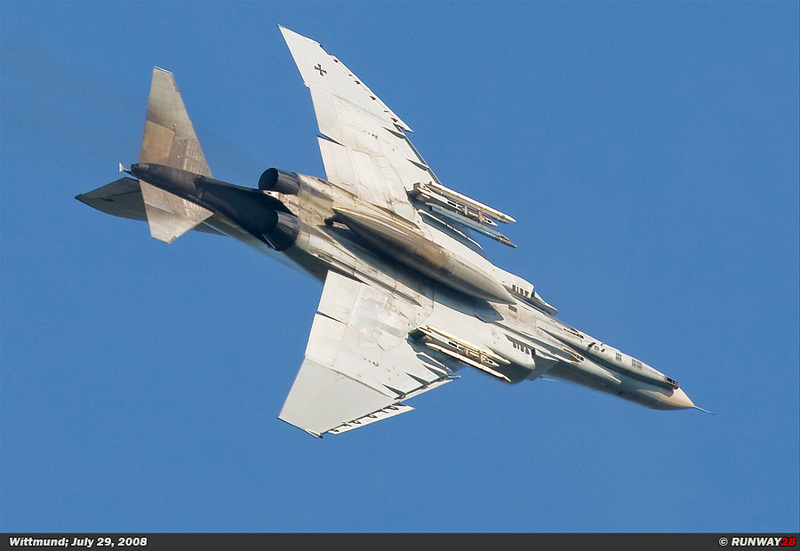 But also from this spot landing shots were very easy to shoot. 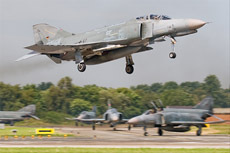 When all the lined up Phantoms finally started to taxi to the runway, the background began to fade out because of the huge amount of black smoke. 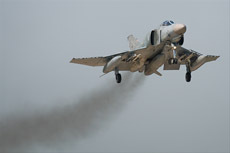 The woods in the background disappeared in a thick layer of black smoke produced by all these Phantoms which were scattered over the whole platform. 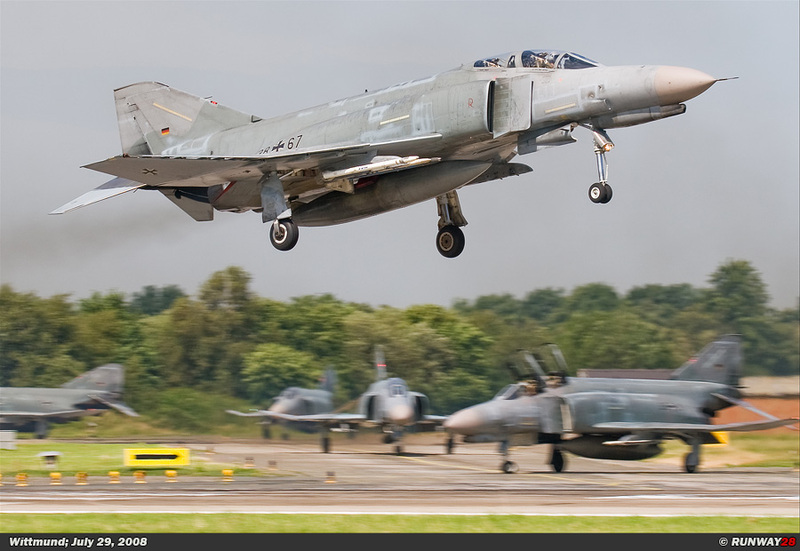 With much noise all the Phantoms went airborne and they disappeared one by one on the horizon. 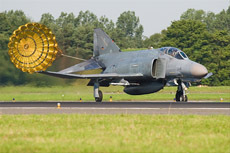 plumes from the wheels during touch-down were a nice sight. 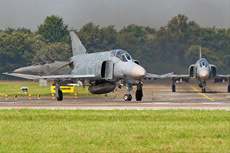 The Phantoms were just hanging a few meters above the ground when I pointed the camera to the left side of the runway. First the Orange F-4 came in followed by the “50 years Phantom” marked F-4 and finally the Neuburg F-4. 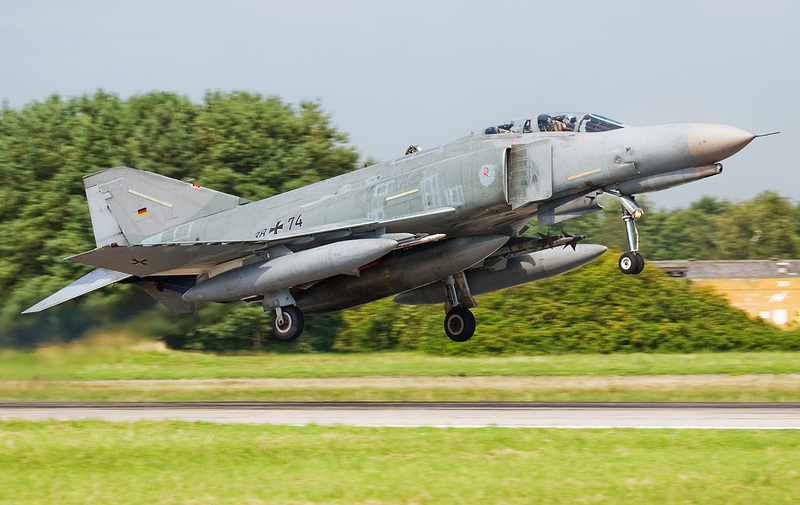 Half an hour after the coloured Phantoms came in, also the rest which was still in the air arrived for landing. 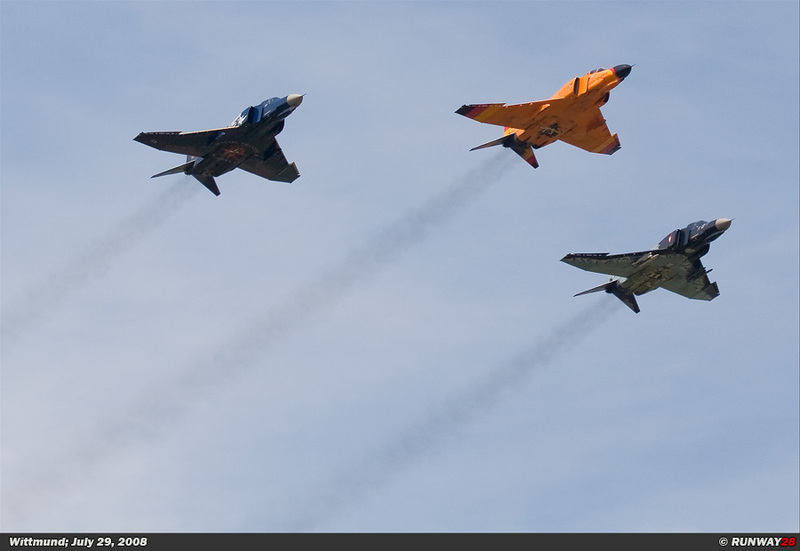 It took about 30 minutes before they were all in. 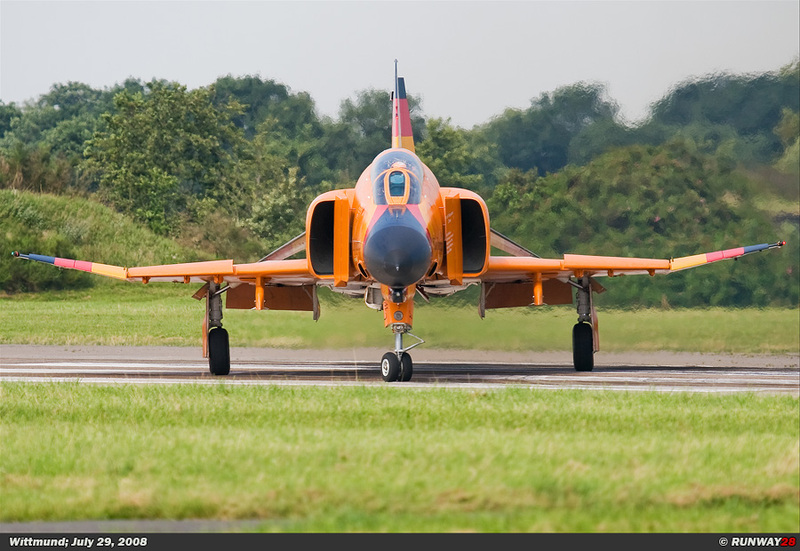 After the arrival of the last Phantoms, I decided to move myself again to another spot, this time to the head of the runway. 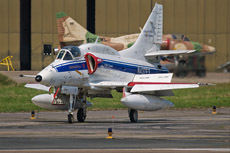 Finally the first two A-4 Skyhawks had started their engines; it was quite late in the afternoon before they went out for a flight. 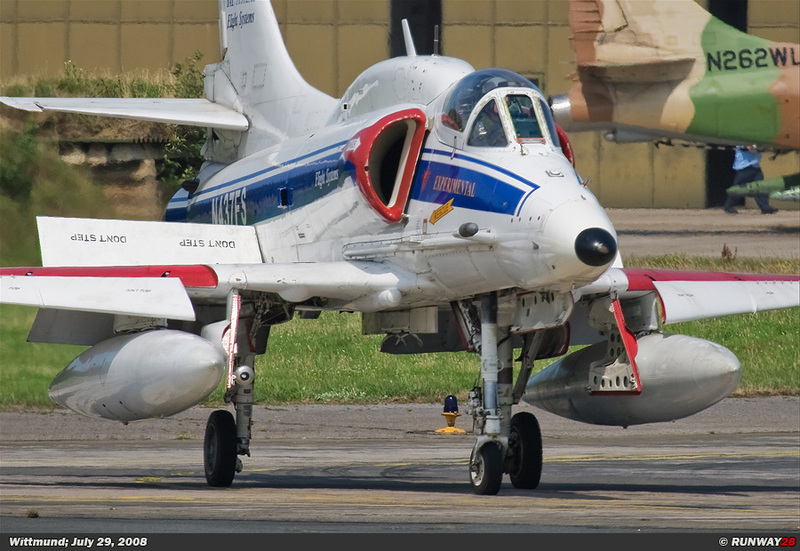 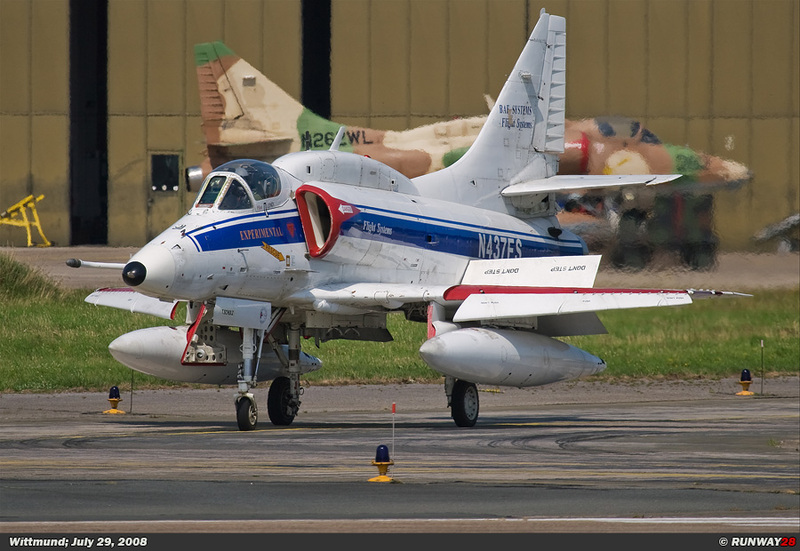 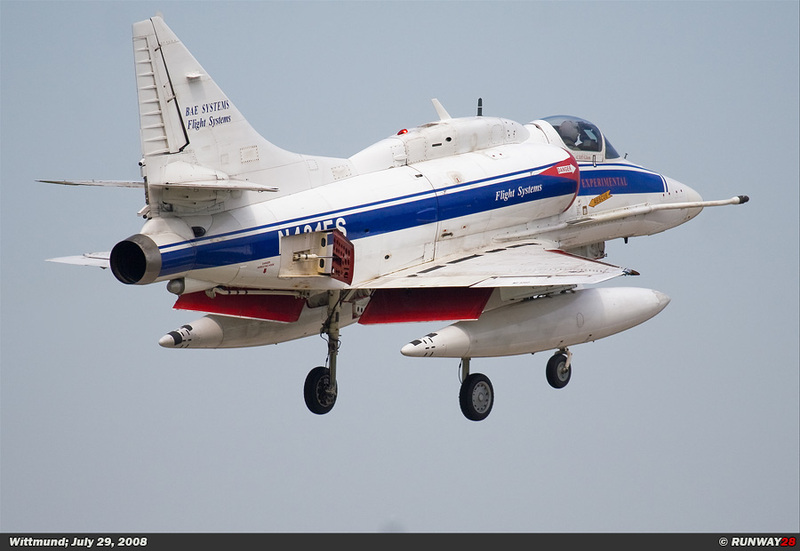 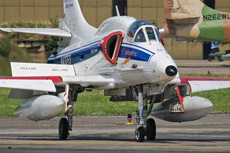 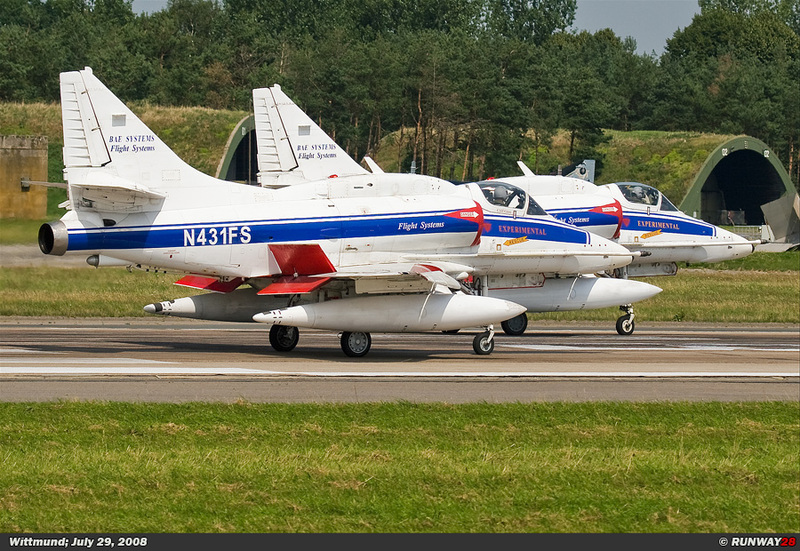 There were two white Skyhawks taxiing to the runway and they took off in a tight formation. 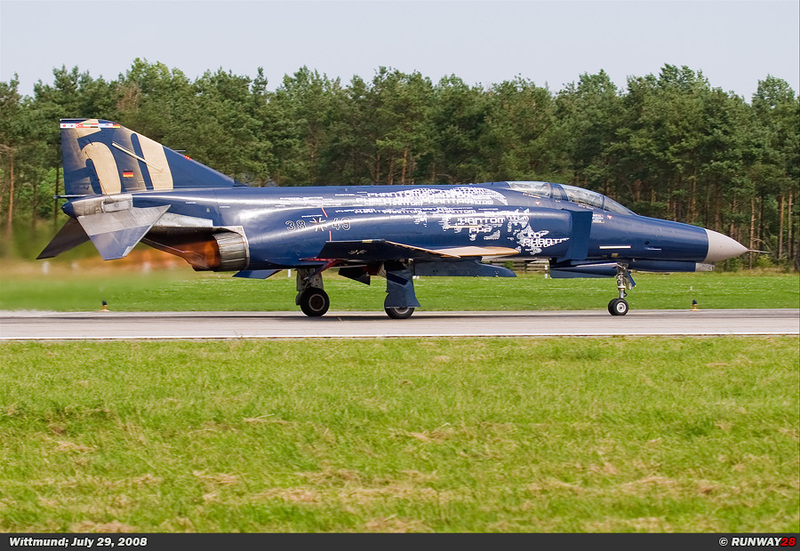 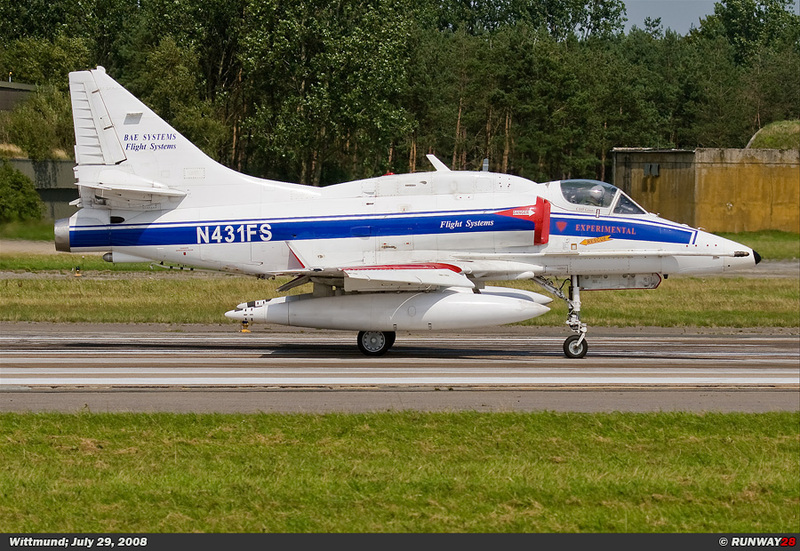 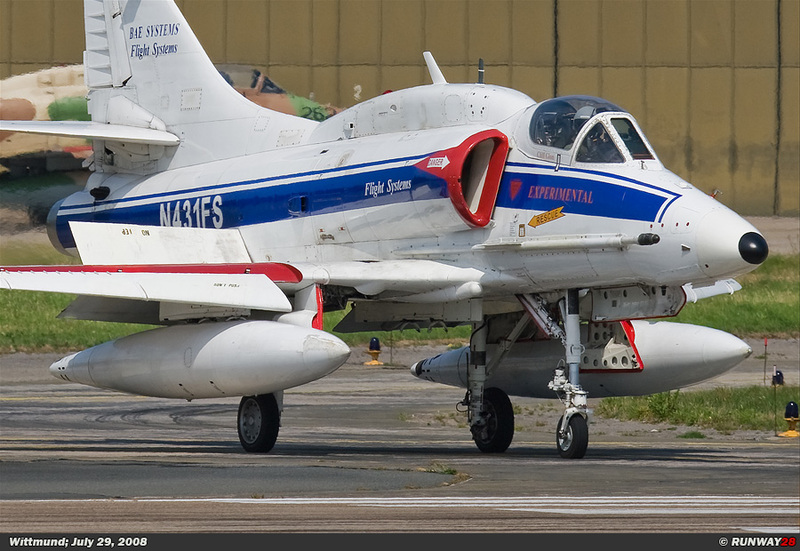 The Skyhawks on Wittmund are owned by BAe Systems and are used for test flights and target towing for other aircraft. 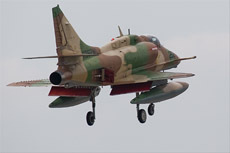 Later on another two Skyhawks would depart; this formation included the former Israeli Skyhawk which was painted with a camo pattern. I didn’t have the opportunity to photograph these two Skyhawks, but I was able to catch them during landing later on. 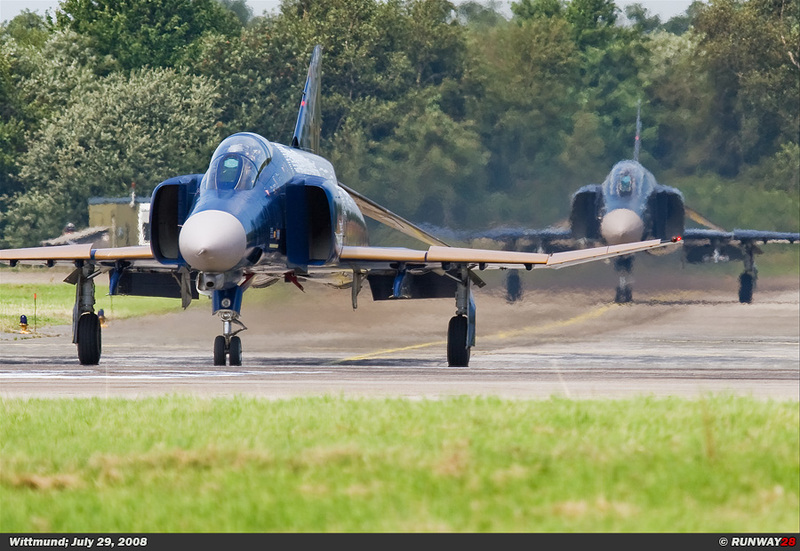 Meanwhile, when I moved to the landing area another formation of Phantoms took off. 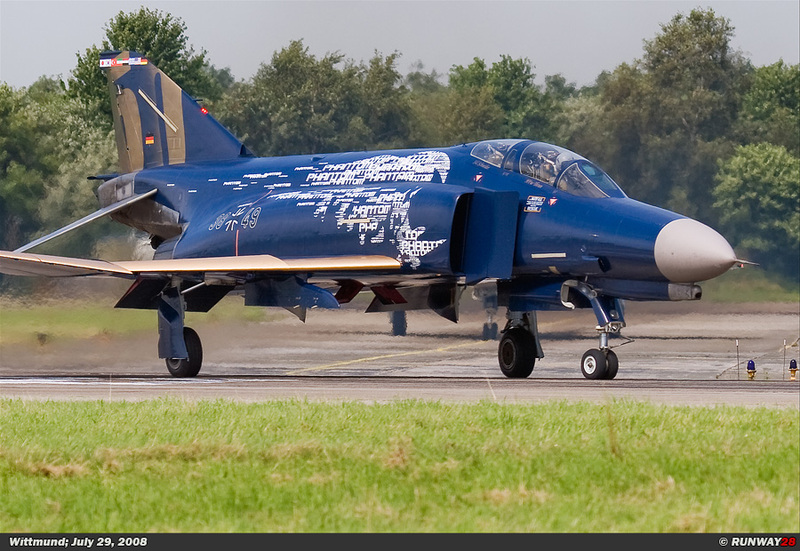 I would make the pictures of those Phantoms later on at the landing area. 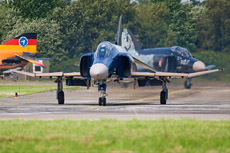 The Skyhawks came in half an hour after the last Phantoms took off. 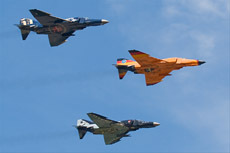 During the landing of those Skyhawks I was able to catch the first two under some sunlight; the second pair came in under a cloud covered sky. Later on in the afternoon it started to rain, so they came in just in time. 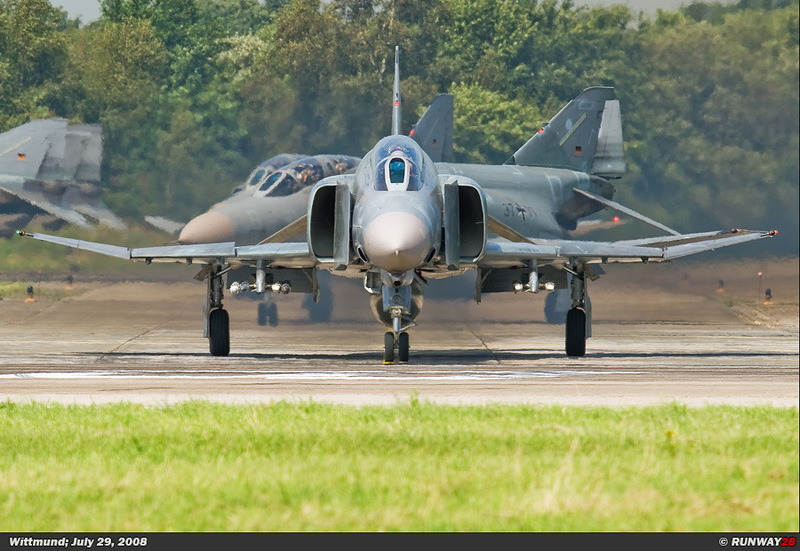 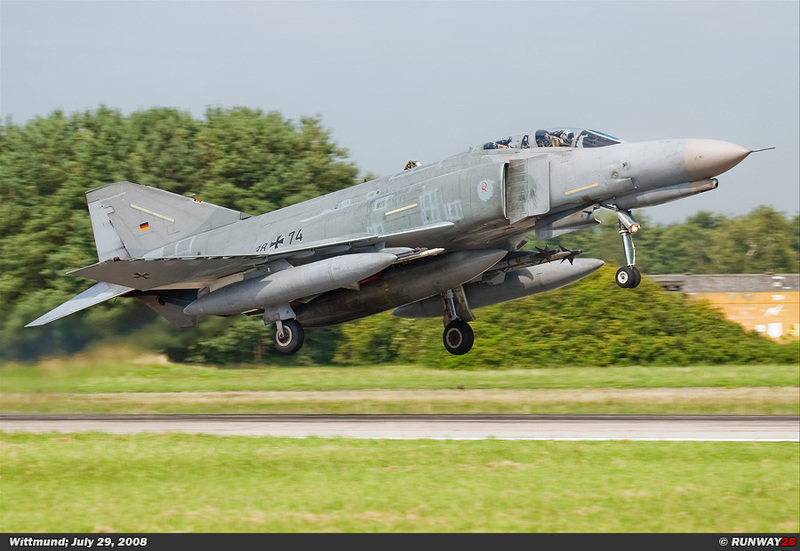 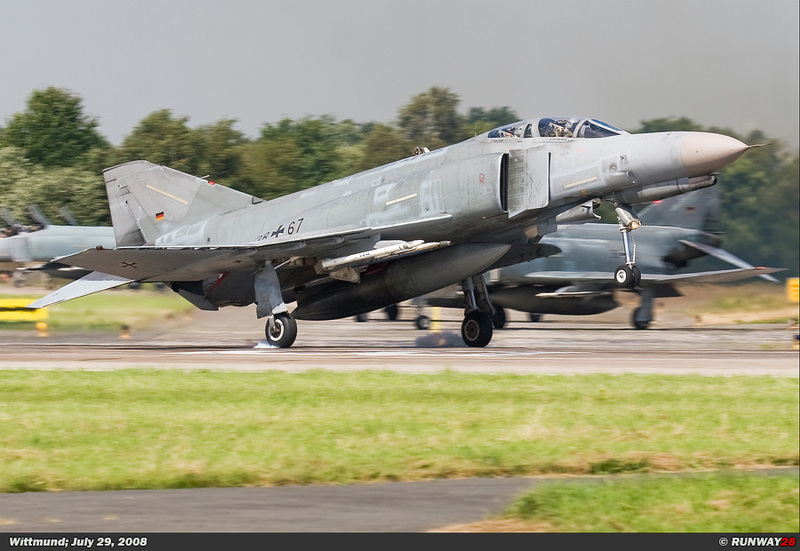 When the last Phantoms were back at Wittmund, I decided to go home; It was already 4 pm. 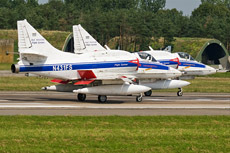 After one of my most productive days ever, I went back to the Netherlands with a satisfied feeling. 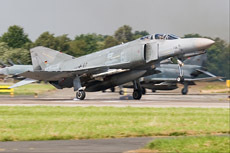 With 27 different Phantoms and 4 Skyhawks in the pocket, I had collected a nice extension for my Phantom photo collection. 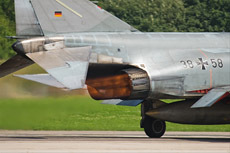 After a four hour drive I was back home again without facing any problems on the road; I could start relaxing and enjoying my 600 photos of today’s trip.